High noise reduction is where the Inexa TNF products excel. When correctly in- stalled, they provide maximum quiet and comfort by reducing unwanted structural and airborne noises. The high noise reduction bulkhead panel TNF 2SM has a good noise reduction value – only 50 mm thick, yet giving a lab value of Rw=44 dB. This B15 class TNF 2SM panel has exactly the same dimensions and appearance as a standard panel, but provides real privacy due to its superior insulating properties. With a free span up to 3000 mm, the TNF B class ceilings are the lids on the TNF quiet cabins. The TNF ceilings have a noise reduction of Rw=44 dB (lab value). 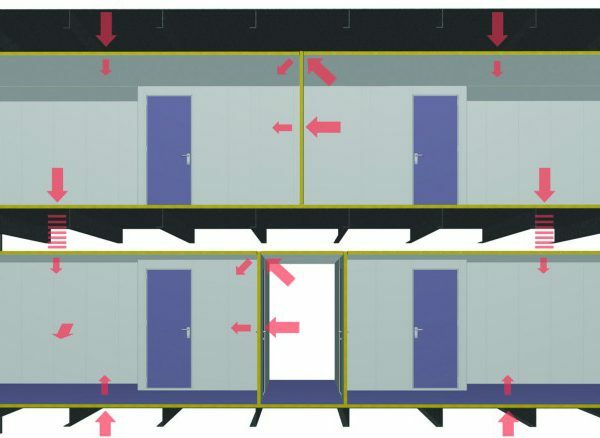 In combination with TNF 2SM bulkhead panels, a field value of 40-42 dB noise re- ductions can easily be achieved between cabins and between cabins and corridor. Used in conjunction with a steel deck, the vertical noise reduction will be Rw=60 dB (lab value).